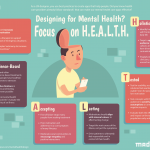 What’s the difference between accessible, inclusive, and ethical design? It’s easy to use the three terms interchangeably. But they’re not the same. And while some designers may disagree on the details, it’s important to understand the broad distinctions. Accessible design is the creation of products or interfaces so that people with disabilities can use them. One common example of accessibility is a ramp, put beside stairs. The stairs are the most direct way up, but the ramp is more accessible for people in wheelchairs or on crutches. The Web Content Accessibility Guidelines (WCAG) outline how to create digital properties that are accessible for people with visual, auditory, and mobility disabilities. The current WCAG guidelines are WCAG 2.1. Inclusive design goes a step beyond accessible design. 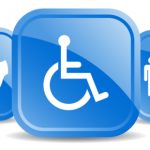 Where accessibility accounts for people with disabilities, inclusive design is for everyone. or are afraid of the water. In another example, an accessible design might be all black and white, with a very large font. That would have a high contrast, which is beneficial to people with poor vision. But it’s not an attractive look. An inclusive design is beneficial to everyone. 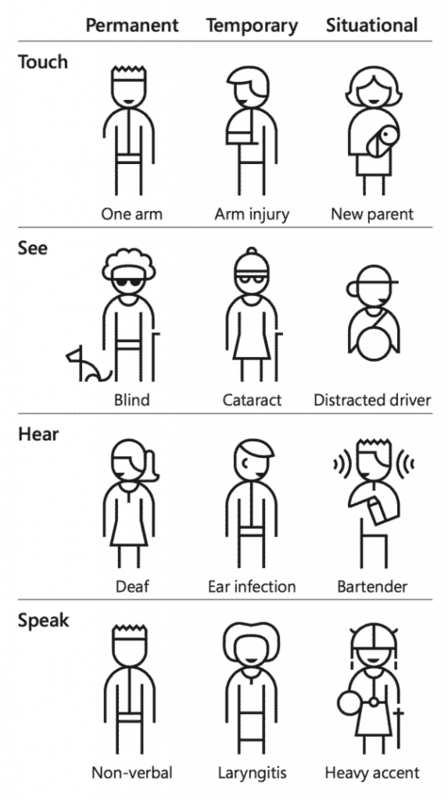 Microsoft’s Inclusive Design site created a Persona Spectrum to show the many types of “disabilities” we all encounter, which make inclusive design so important. Some authors will define inclusive design as the method for reaching universal design. Others argue that universal design is one-fits-all, where inclusive is one-fits-one. Here is where we stumble into ethical design. Ethical design is the most complex of the three. Let’s start with an overly simplistic view. Accessible design has the “simple” choice. Just make the design better for people with disabilities. Inclusive design asks the designer to make a decision that benefits people with disabilities as well as other people. 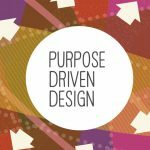 Ethical design requires the designer to consider who else may be impacted. Slate provides an example of a soap dispenser where the sensor can’t recognize dark-skinned hands. While the soap dispenser may be a solution for accessibility and the designers may have thought it was inclusive (since you don’t need two hands to use it, and it cuts back on germs), it wasn’t. It is only usable by caucasians, meaning it’s not inclusive. And to put it out into the world is unethical. In other words, where you may check for accessibility, and design for inclusive solutions, you need to plan for ethical solutions. It takes time and effort, but it’s the only way to design for real people, and real life. Do You Have an Accessible Website?